For such a simple game King of Tokyo is bags of anarchic fun. Simple enough for children to play, and exciting enough to keep families interested. Its four star review means that we’d be happy to recommend it as a gaming experience, although some of that might be imparted by the rollicking energy imparted by playing with a child who lives and dies with every roll of the dice. To be honest. I suspect that might be worth a solid half star in almost any game by itself but I haven’t actually ran the experiment. Does anyone have an eight year old they might be willing to donate to Meeple Like Us for experiments? Let us know in the comments. Could we offer King of Tokyo the same enthusiasm when we approach it as an accessible experience? Let’s do to the game what the monsters did to Tokyo, and tear it down! Colour blindness isn’t an issue in King of Tokyo. Monsters are identified by their own distinct appearance, and colour is not used as the sole channel of information anywhere. So, we’re giving King of Tokyo a strong recommendation in this category. Visual accessibility is also pleasingly high – each of the monsters has a different physical profile that allows them to be differentiated by touch, and the dice are not only very well contrasted they’re also larger and chunkier than standard. 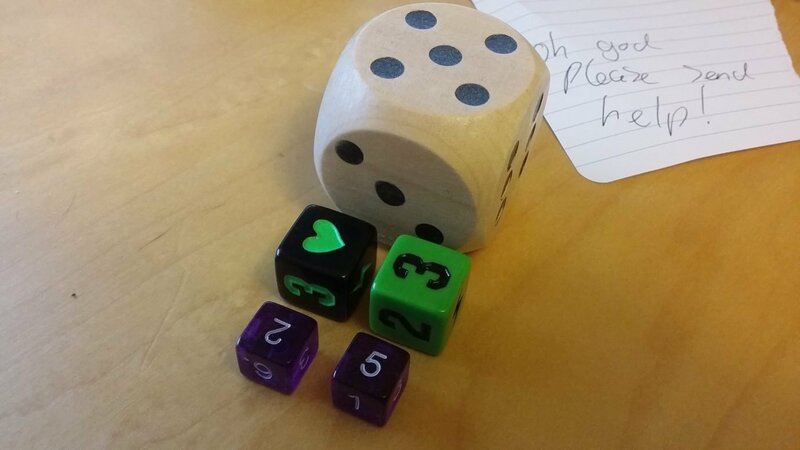 The image below shows the King of Tokyo dice (in the middle) versus a 5cm over-sized d6 and two standard purple d6s. The King of Tokyo dice look less impressive next to my oversized one, it’s true. The symbols are recessed into the faces, and the lightning, claw and heart symbols can all be differentiated by touch, as can the number 1. The other numbers too can be identified, but it’d take a little bit of practise to be sure you’re identifying them correctly. It’s very feasible, although pips would have been so much better for that. If using the provided dice is not an option, you’ll maybe have a problem. They’re d6s, although with non-standard faces. You can use accessible alternatives, but you might need as many as eight of them at a time. Otherwise you need to add some kind of book-keeping system to the targeted rerolls that serve as the core of the game. Some special cards lead to special tokens being assigned to other monsters. These include poison markers (take a point of damage at the end of a turn if you don’t heal it) or shrink ray markers (roll one fewer die). These are small, and offer only visual discrimination. However, you can work around this – they don’t appear in every game, and you can cycle them out of the available upgrades if it’s going to be a problem. Energy is handled via cubes, so they are distinct and can be assessed separately. The monster cards have a wheel that lets you set victory and health totals, and these aren’t particularly easy to make out. They are just arithmetic counters though and it’s very easy to swap them out for a more tactile system such as accumulating coins or matches. The interesting element here about game state is that it’s as simple as ‘which player is the king’. The game board, such as it is, is almost entirely superfluous other than as an aesthetic backdrop. So, King of Tokyo is a game we’ll recommend to those with visual accessibility requirements, up to and including total blindness. That is, provided you trust your group to let you know the opportunities you have for buying cards and making use of them in conditional situations. 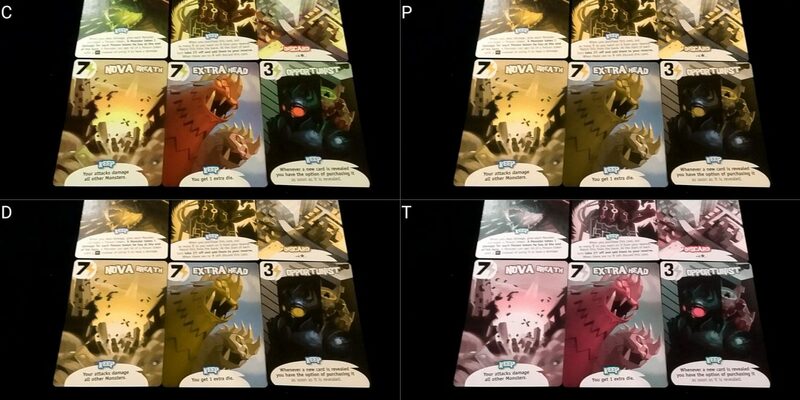 It would have been nice if the font on the cards was more accessible, and if the special effect markers had some kind of differentiation. Those would be enough to raise it another category, up to strongly recommended, which is a band that we rarely see games enter. There are some really nice risk versus reward versus short term versus long term decisions in King of Tokyo. They’re the key to playing well, and to consistently winning. They’re not key to having fun. Let’s get the problems out of the way first. There’s a reading level associated with the game, but it’s neatly firewalled away into the upgrade cards. You can play a fun and frantic game of King of Tokyo without any of those cards, although its re-playability might be somewhat low. They’re not integral to game play though, and if you are worried about cognitive accessibility they can be removed without worry. You can treat energy as an extra score, or as an extra attack, or whatever. Even leaving aside the reading level issues, the upgrade cards add considerable cognitive complexity. They add an economic element, as well as a conditionality not otherwise present. They also sometimes decouple action from outcome – spitting poison for example will only impact the target at the end of their turn, which can lead to players taking damage from a cause they may not have appreciated at the time . 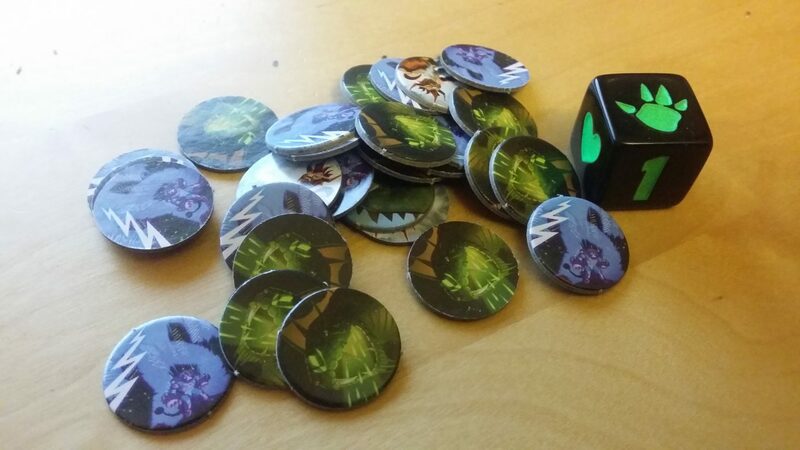 Similarly with other long lasting debuffs, such as the shrink ray, the presence of tokens on a player does add some additional cognitive processing. The rules for getting rid of debuffs though are straightforward though – you spend a heart to rid yourself of each token. Numeracy is a more significant requirement since basic arithmetic is the core of dice play. There’s a need to add, subtract, and deal with the slightly odd dynamics of the victory point dice. You need three matching dice to score victory points, and then you get the number rolled. But each additional matching dice gives you only one additional VP. It’s a little counter-intuitive, but not something that any one player has to do themselves. More important is the ability to understand on at least an intuitive level the basics of probability. That’s how you work out whether dice should be kept or banked. Similarly, this impacts on the push your luck element of choosing to remain in Tokyo as opposed to yielding to another attacker. That requires an appreciation of the delta of damage. Again though, this is only if you want to play well. If you just want to roll dice and fight with big monsters, you can just roll away and see what happens. Dice are after all, over the long term, a decent equaliser. Cognitive complexity is in certain respects optional. Game flow is consistent, although the rules of engagement will vary from turn to turn – the exact targets of an attack depend on who is in and out of the city. As such, a player may find one turn they’re doing damage against only one player and the next that they’re doing damage to everyone. The visual design of the board reinforces this though, so it shouldn’t be a major barrier to play. Memory wise the game has very little that you need to keep track of that isn’t presented clearly in front of you. The game board shows who is in and out of the city, and everything else is represented by cards or tokens. There aren’t a lot of these. We’re prepared to offer a recommendation in both these categories, although be mindful that it might be necessary to remove some gameplay elements to ensure accessibility. As usual here, when suggesting game modifications we’re interested in whether you’re left with a fun and playable game. The answer we think is yes. There’s a lot of interesting stuff in the way King of Tokyo creates an emotionally engaging experience. As discussed in the review, we played this with a ten year-old that got very engaged in play – he certainly seemed to enjoy it, but it was sobering to watch the emotional impact of each turn and how the imminent inevitability of defeat brought on (temporary) sulks. It’s not possible to generalise too broadly from a single data point here, but we can go through a number of features that are likely to have impact. First of all, it’s a game of direct competition, and it also has player elimination. Games are reasonably short, so elimination need not be all that problematic. However, you can be knocked out quite quickly (especially if you mistime an early entry into Tokyo) and then watch the diminishingly effective turns of your opponents play out in slow motion. King of Tokyo doesn’t work very well at all as a one on one experience – it seems designed around the idea of a damage differential between the inside and outside of the city. It’s the only way really to force an opponent to yield – to do so much damage that they have to retreat in order to heal. When going toe to toe in 1v1 and swapping control of the city, an equilibrium is often observed until someone manages to get a few lucky rolls. So, while games between four players are quick, they can drag on if the balancing is thrown out of whack by an early elimination. You might be sitting on the side-lines for a while. 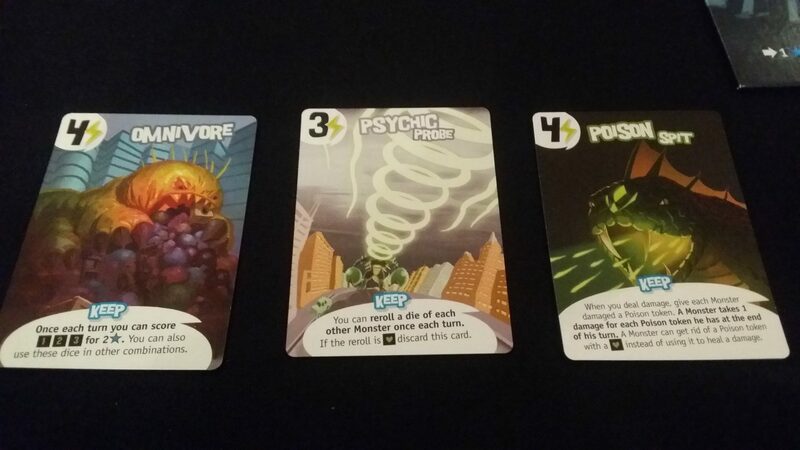 ‘Parasitic Tentacles’ lets you ‘buy’ cards from other monsters. They don’t get a say in this. 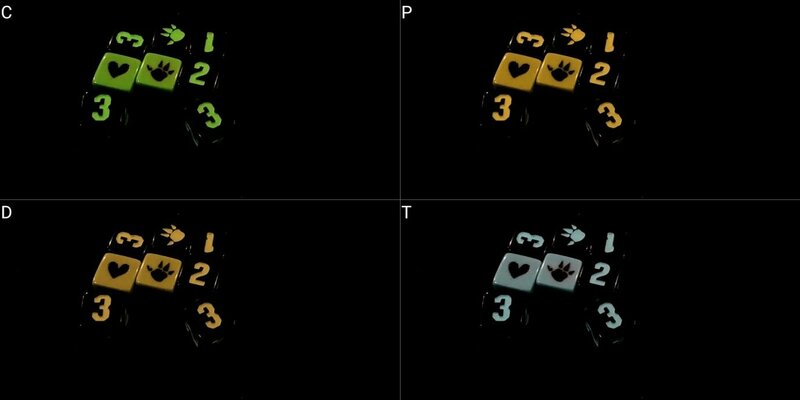 ‘Psychic force’ allows you to re-roll one of another monster’s dice. As with most of these kind of mechanics, it’s all fun and games until someone has a massive tantrum. It’ll be me if you reroll one of my dice. With the right group, with everyone having fun, this is all great. You need to be wary though in situations where emotional accessibility may be an issue. This isn’t an isolated example – the deck is full of these kind of fun (or infuriating) effects that can lead to either riotous laugher or perhaps just rioting. King of Tokyo is a very ‘bursty’ game too – that means victory, when it comes, can materialise over a turn or two. It’s perfectly possible to go from full health at the end of your turn to dead and out of the game by the time it comes around again. You have very limited ability, outside of a few special cards, to change that outcome. Mistakes of judgment can be very difficult to undo, and the result can be an early ejection with an extremely large score disparity. The game system makes ‘ganging up’ a core part of the play, but it’s interesting in how it makes it largely opt-in. It’s ‘everyone versus the King’, but as soon as you take a single point of damage you can yield to make someone else the King. At that point, they’re the victim and it’s you that’s part of the gang. It’s a very healthy kind of ganging up that has the bizarre trait of being almost entirely consensual. Nobody is bullied in this, and it’s very difficult for players to co-ordinate to make a single player’s life difficult. Turns are quite quick, focusing as they do primarily on the rolling and rerolling of dice. Downtime is limited, but it is coupled to a degree of inevitability about your fate if you happen to be the King. You can end your turn full of health and begin the next as a tattered smear of fur, without you being able to do anything to prevent it. It’s a push your luck mechanic that may not sit well with those with certain kinds of emotional control condition. We’re going to offer a tentative recommendation here, with the usual caveat – this is all part of the fun of the game, and if everyone takes it in that spirit it can be genuinely hilarious. 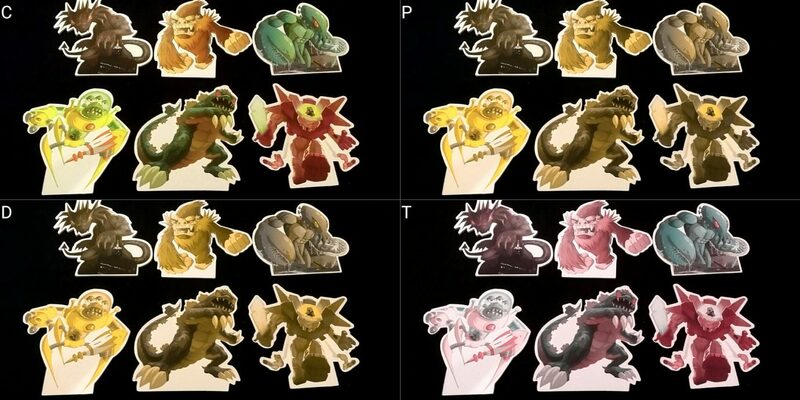 That’s going to be highly dependent on group composition, and you should consider the above carefully before introducing King of Tokyo to a group where emotional accessibility may be an issue. Of these, only rolling dice is something you’ll do every turn. The downside there is that you roll a lot of dice, sometimes three times in quick succession. The dice are large and weighted, which makes them easier to manipulate than those of normal size. You’d be well served by making use of a dice cup and dice tray though, because the increased weight also means that they tend to have correspondingly greater impact if they go somewhere unexpected. The monster location on the map is really only to show who is in and who is out of the city. There’s no need for fine positioning of tokens, and no game impact to ignoring the indicated markers at all. As long as people know who the King is, the board’s job is done. You may or may not accumulate a significant number of cards during play – you’re more likely to find yourself with two or three than you are to have five or more. The cards are played face up in front of you though, so there’s no need to keep them secret from anyone else. This eliminates the issues we often have with cards in games. If physical interaction with the game is not an option, it lends itself well to play through verbalisation. Each die face can be uniquely described, and each card on offer for sale has a distinct name. As such, we recommend King of Tokyo for those with physical impairments. There is a reading level associated with the game, but no other requirement for communication. As a result, we recommend it in this category. After the massive rant I had in the Tales of the Arabian Nights teardown, it’s nice to return to a game which leaves a less bitter taste in the mouth. It’s easy to say that this is nit-picking, and it’s certainly easy to look past it even if you don’t. But there’s no reason for it, and that’s the worst kind of skewed gendering. There could just as easily have been a 50/50 split with no game impact, and it would have been more likely to offer girls a chance to pick a monster they can identify with more easily. Again, you might roll your eyes and deny anyone can identify with the monsters in the first place. If you have ever seen a Pixar movie, you’ll know deep down that you’re wrong. I’ve been accused of ‘having an agenda’ in many of these teardowns. It’s true – my agenda is not hidden. I want more people playing games, and I want more people to feel as if the games are designed for them too. This kind of lazy gendering doesn’t help that cause. It doesn’t ruin the game, or even seriously undermine it – but it is so easily fixed with so little cost that it is a little frustrating. Otherwise, I have few, if any, complaints. The game has an RRP of £30 and supports as many as six players at a time. It doesn’t play well at low player counts, but there are variants that can be used (such as each player controlling two monsters each) that add a degree of vibrancy to play. As such, you’re not too tightly constrained by player numbers to regularly enjoy it. More than this, the design of the game is flexible enough to support adults and children simultaneously – it has enough for everyone to enjoy. Games are (usually) over quickly enough to allow it to fit neatly into small gaps in the busy schedule of a day. Overall then, we’re recommending King of Tokyo in this category. There’s a lot of dice-rolling, but an effort has been made to make that as accessible as possible – the dice are big, weighted, and well contrasted. Those with visual and physical impairments though may find the management of dice-rolling to be difficult without the presence of someone else to alleviate issues. The game permits for player elimination, which is in itself a natural mechanism for supporting flexible dropping out of play. The game though usually takes between twenty and thirty minutes, meaning that the duration is unlikely to exacerbate issues of physical, cognitive or emotional distress. It’s nice though that if that occurs there’s a natural exit point from play. It’s an intensely competitive game, which creates intersectional complexity across the board – much accessibility support at the table depends on people making an effort to ensure nobody is being disadvantaged. A competitive game, with a competitive group, disincentivises that and King of Tokyo presents numerous opportunities for a lack of disclosure to have game impact. For example, you might ‘forget’ to remind a blind player that you’re impacted by their shrink ray, or that they had rerolled a heart they could have spent to remove their poison marker. This particular issue is highly coupled to group dynamics, and we reiterate our common advice – endeavour to play games with people as interested in the group’s fun as they are in their own. So, King of Tokyo is not only a good game it’s also a game that almost everyone could play. That is a rare conjunction of things, and it’s always incredibly good to see it. As with many games that do well in each of these categories, there’s potential for it to do even better with a handful of tweaks. In this respect it serves as a two-pronged good example – that games can be accessible, and that considerable gains can often be achieved with minimal cost. 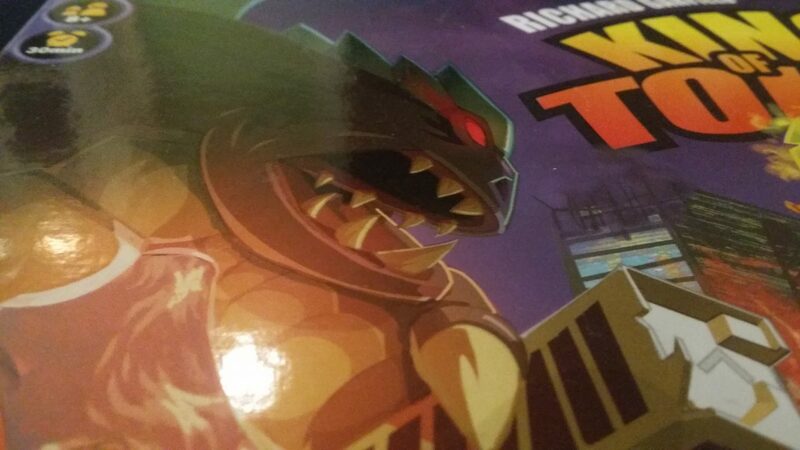 We gave King of Tokyo three and a half stars in our review – it’s fun, it’s frantic, and it’s easy enough for anyone to learn. It’s short enough to fit in around a busy day, and exciting enough to make it worth that effort. We’d recommend you check it out. Visually impaired players interested in checking out King of New York rather than King of Tokyo will likely find this post over on Sightless Fun to be very useful.